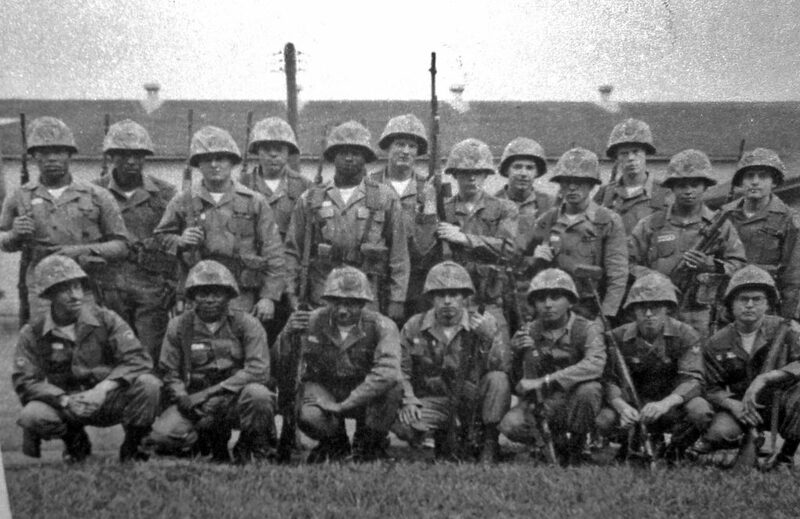 Platoon in HQ & HQ Troop in 1965 before we deployed to Vietnam from Schofield Barracks, Hawaii. Sgt. Marcel Nelson was our Platoon Sgt. in Hawaii, and the TC of HQ5 Track. He lived in the room with Sgt. Iman (Our Medic) on the 2nd floor in the Barracks. He was a big guy and had the deepest voice I have ever heard – with the exception of the guy that sang “Old Man River”, but it was deep like that. The day we were out Sgt. Nelson was in the “hatch”, but the “hatch” had been retrofitted with the new armor steel plating around the .50 Cal machine gun. I believe it was either Almer Jackson, or Robert Thompson that was driving the 113 that day. But, we were again out about 500 meters from the front of the Main Gate at Cu Chi base camp. When all hell broke loose and we were receiving fire, and we were dishing it out back at them. A round hit and spun around that new steel armor and came off, and hit Sgt. Nelson in the arm. Well, he was taken to the 25th Hospital at Cu Chi, as it wasn’t the 12th Evac yet – and we really didn’t see him again, but heard that he was really bad. 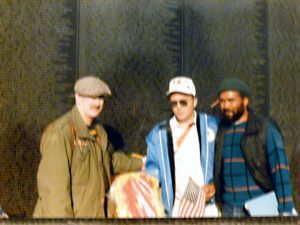 Some years ago while going to the WALL in D.C. – one of the guys from the 25th would always make arrangements at a hotel for us, and whoever wanted to head to D.C. for Veterans Day in Nov., we would go to D.C. and have a mini reunion. There were always about 50 – 60 guys that would attend, meals together, hospitality room, and all head to the WALL together. It was vets from just about all the Units of the 25th and usually about 8 – 10 of us 3/4 Cav guys. So, one early afternoon I’m sitting on the floor of the hospitality room and showing pictures, (no CD’s back then, just pictures in a scrap book, man we sure have moved up in technology since then.) Maybe some had slides but was a pain dragging those projectors, the trays, and trying to get a sheet hung up from someone’s bed on the wall of the hospitality room, would have been better if the room had been painted white. I hear this voice as I had my back to the door of the hospitality room, low and behold I turn around and who the hell was standing there, Sgt. Marcel Nelson. We talked shared pictures, and talked about our families today. He lives in Mt. Airy, Louisiana, raised 10 children and sent every one of them to college. We send Christmas cards back and forth every year since then. After talking and showing pictures, as he wasn’t staying at the hotel, he just heard about it, from someone as he was visiting D.C. and went to the WALL and someone brought him over. After hours of talking he said Rog you going to the WALL tomorrow, I said yes, so we and a few other guys we had been with in Hawaii and Nam said we would meet at the WALL the next morning at about 10:00 a.m., which we did. 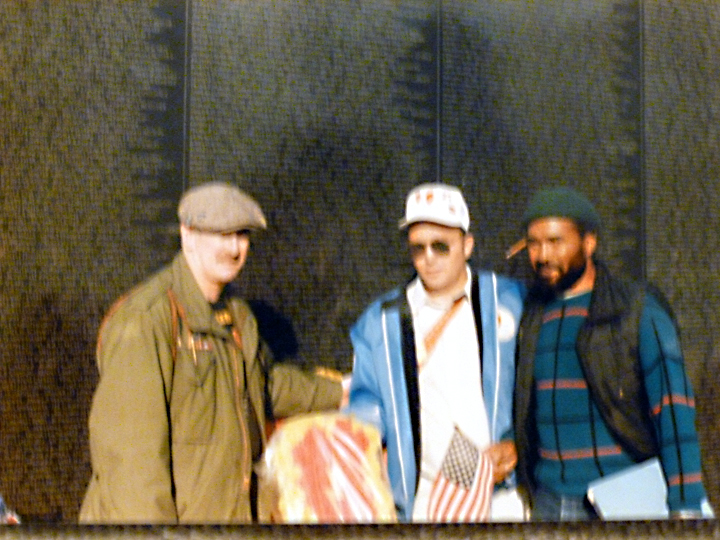 I also have a Great picture of us at the WALL with the three of us that were together back in Hawaii & Cu Chi Vietnam. He told me what happened after he got shot in the arm. He went to the 25th Hospital and the doctors told him there that he would probably lose his arm. Sgt. Nelson had huge arms, it was like arms you see today from guys that work out with weights. He begged them not to take the arm off, so the Doctor as he told me, OK we will see and make sure no infections set in. He was also transferred to a Hospital in Saigon for a while, and said he came back to the 25th, but not to the 3/4 Cav. He put in his retirement papers and said he got out of the Army after that. His arm was saved. We had a good time at the Reunion in D.C. and also when we went down to the WALL. It is something when you run into someone you were with in combat. We talked on a bench for about two hours, very near where the three soldiers are, about our families and what we have been doing since Nam, about all the guys, all that happened, and where everyone might be today, and if he had heard or met any of the other guys. He hasn’t been to any of the 3/4 Cavalry Reunions, but there is always a chance he will one day. Since that time, I have now met about 200+ guys that were in the 3/4 Cav the same time as me, they come to our 3/4 Cav Reunions. Again, why I can’t wait for next month in KC. Kansas. Scouts Out.